Humility’s much easier to manufacture than it is to internalize, and as long as we’re more focused on humility’s appearance, we’ll never experience its transformation. Humility’s simplicity is what makes it so damned difficult. It’s simply thinking about, promoting the interests of, and celebrating others more than yourself. Instead of focusing on others, we tend to promote, celebrate, and focus on ourselves with a little self-depreciating twist to give the appearance that we really don’t take ourselves that seriously. I wasn’t so humbled about it—that was complete nonsense. I was excited. And you know what? That’s okay. What’s not okay is putting on some false sense of humility in order to draw attention to myself. Now whenever I hear someone tell me how humbled they are, I recognize it for the B.S. it is. 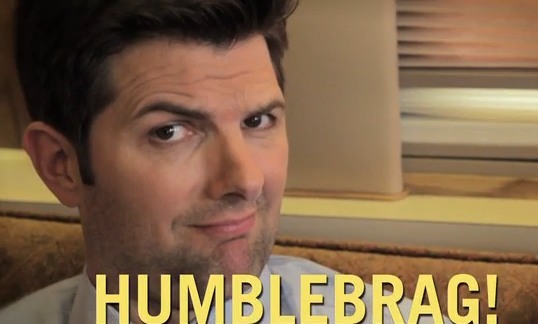 (Also, I can’t read “I’m so humbled” without hearing it in Jeremy Iron’s Scar voice.) Just tell me about the awesome thing you’re experiencing so I can celebrate with you. Humble people have strengths, positive qualities, and nice outfits. It’s okay. Say thank you and move on. Truly humble people are amazing to be around. Want to be like them? Start by looking for ways to celebrate the awesomeness of others and stop looking for a way to promote your own. So how *do* we give God glory? Will you tackle that in another blog post? I think it’s more about our posture than it is our words. We give God the glory in the way we live not just by blowing it off when someone compliments the special music you did at church. When you recognize that the gifts you have are provisional and live in a way that those gifts are a blessing to others people can see what you do and glorify God because of your giftings. Point No. 4 really strikes me the most. I’ve heard people claim God working through them when they scored a touchdown or wrote something beautiful, but I never got the mindset behind it. Why not acknowledge when you did something well and then give thanks to God in prayer when you’re alone? Is your action more noteworthy because you mentioned God and someone else with the same achievement didn’t? Great post. I wonder if you’re going to any more on the Seven Deadly Sins walkthrough. I am in the middle of a post on wrath. Don’t worry! I’ll see it through. . . maybe. You wouldn’t be succumbing to Sloth, now, would you? I’ve used, “I was so humbled by” way too many times. Many times I just mean that I was embarrassed because I don’t know how to take a compliment because I spend so much time worrying about what everyone thinks of me. So good! I feel like so many people say “I’m humbled” when they really wanna say “I’m awesome!” Gotta keep it real. Though there is much food for thought here, and overall I agree with the point and purpose, some parts of this left me a bit uneasy. First of all, you seem to be judging the intentions and attitudes of any & all speakers with the generalized tone of the article. There have been times when I’ve (for direct testimony) been excited about the response of others to something I have had a hand in and other times it was truly humbling because it was so unexpected or surprising. So I think the greater point is for people, Christians or not, who want to embrace humility is to stop and evaluate using “I’m humbled…” and like phrases to be sure that it is authentic- truly describes what they feel and want to convey. I don’t think the phrase should be thrown out of our vernacular but that is what can be conveyed in an article written this way. The same goes for #4. When are we to give God glory? I agree that most of us have a hard time just saying thank – you, but glory does have to go to God pretty much all of the time- especially when one has prayed to be a vessel, for success, impact etc. and it happens. Humility can be elusive, but the Bible wouldn’t tell us to clothe ourselves with it if it were impossible. I find inspiration in the CS Lewis quote. And as Christians it seems that if we follow Jesus’ path, “look not only to your own interests but also to the interests of others” in all things, we will venture into the realm of humility more steadily. Like wisdom, humility is hard to know if you have. But faith in doing things God’s way, examining our motives & intentions, and having truth-tellers in our lives can help us not to think so much about whether or not we are being humble and allow us to exhibit true humility whether we know it or not. Those are my humble thoughts. ;-). Thanks for the response, Andrea. To write a small article that anyone is willing to read, one can’t cover all contingencies and possibilities for misunderstanding. So, it’s best to cut through the noise by speaking plainly and strongly. Of course this doesn’t (and can’t) speak to every issue or person in God’s vast world, so, as with anything, you take what you can from it and spit out the bones. Felt a little burn in the chest while reading this. I’ll take ALL the freedom. Yes please! I love this line! I have totally been that guy at one point, who, at hearing a compliment said, “oh, it’s the Lord through me… nothing I did” and I still felt yucky after saying it. I love that we can receive a compliment and simply say, “Thank you that’s encouraging” and the Lord can still receive all the glory. Great article!! Oh me too, Eric. Me too! Thanks for the comment.